Stability, the spine, your health! As a Personal Trainer and fitness instructor, I can just look at my clients and see in their stance the toll that emotional, mental and physical stress is taking on their physical bodies; the fatigue and muscular imbalances that hunch the shoulders over, compress the spinal column and constrict the breath and energy flow through the central organs. Creating alignment and stability in our physical frame by developing core muscles that support our spinal column is foundational for any other body work we do. What we don't see on the outside is how poor posture affects the functioning of our physiological and organ functioning and this is crucial to our overall health! A spine that is lengthened, not compressed, is a more open channel for energy to flow thru, and each organ of the body has its natural position and place that is, to a large degree, maintained by correct alignment. 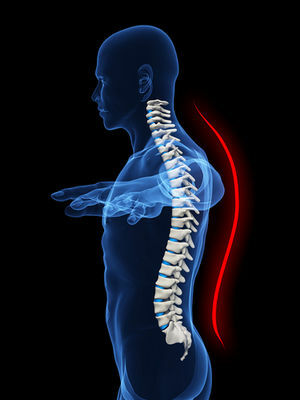 Physiological and organ function depend greatly on a neutral and supported posture. This also affects our ability to fully breathe, because the diaphragm--the primary muscle responsible for breathing--is attached to the ribs, spine and hip flexor muscle. Rounded shoulders prevent the rib cage from being able to fully expand, which interferes with our breathing---this is very important to understand and can make all the difference in the world in your health! The very first thing I work with new clients on is their alignment and foot placement--the integrity of the entire frame begins at the foot! So I analyze foot strike--do they strike heavily on the inside of the foot or outside, check knee-to-toes alignment--and how we can improve if needed--and then we work on getting strength and flexibility all throughout the foot and the ankle. This is when we start working on achieving and maintaining neutral posture thru core strengthening: The most important function of a neutral posture is to keep the body in an upright position and supporting the frame against the pull of gravity. If there is dysfunction in the alignment, excess stress and weight is put on muscles and joints which can lead to a significant amount of pain and discomfort. And if you've ever had this type of back pain you know what this is about! What is neutral posture? The head centered over the shoulders, shoulders pressed down & back, back pulled up out of the hips and chest lifted, knees slightly bent, a gentle pull-in of the belly-button to engage the abs, and feet stable on the floor with your body weight distributed between both feet. Whether seated or standing, we always want to keep the back lifted, and not settling into the hips--it's as if a string is attached to the back top of the head pulling you towards the ceiling and another string is attached to the tail bone pulling you towards the floor. Once you learn how to do this and start to practice it in everyday life, it doesn't take long to get to the point where it just occurs naturally without much thought. And when carrying a heavy backpack, purse or briefcase on one side, the ability to keep the spine in alignment and supported is even more important to avoid imbalances leading to chronic pain. Its also amazing how much more confident people look when they walk into a room with a balanced upright posture! Have you ever noticed that? Body language is powerful and confidence attracts others to us, improving our ability to feel connected with our inner strength and more positively engaged with others. This is one lesson I learned from my mom as a young girl, being always taller than anyone else till I turned about 13 which made me want to hunch over. And yes, my mom did make me walk across my room with books stacked on my head everyday--ha! But she was right--Thanks Mom! Become more aware of your posture during the day by hitting the pause button and checking in with your body!